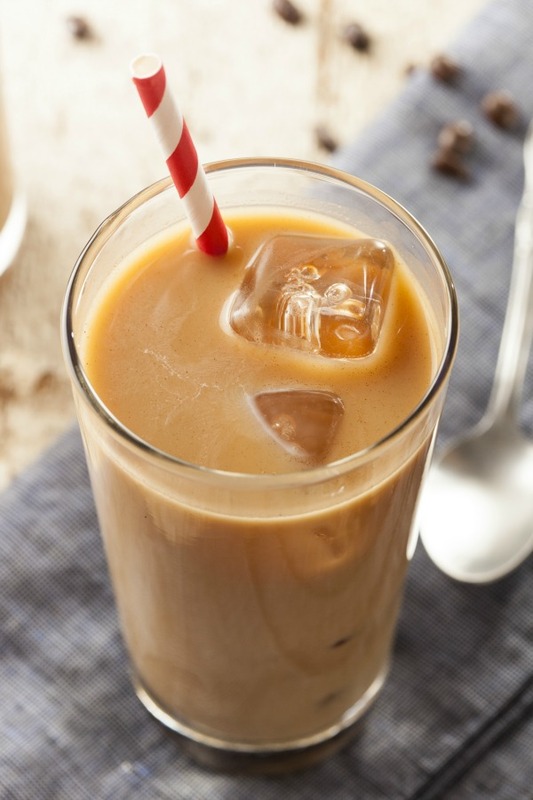 Supercharged Iced Coffee Recipe especially for fat burning and hormone balance! 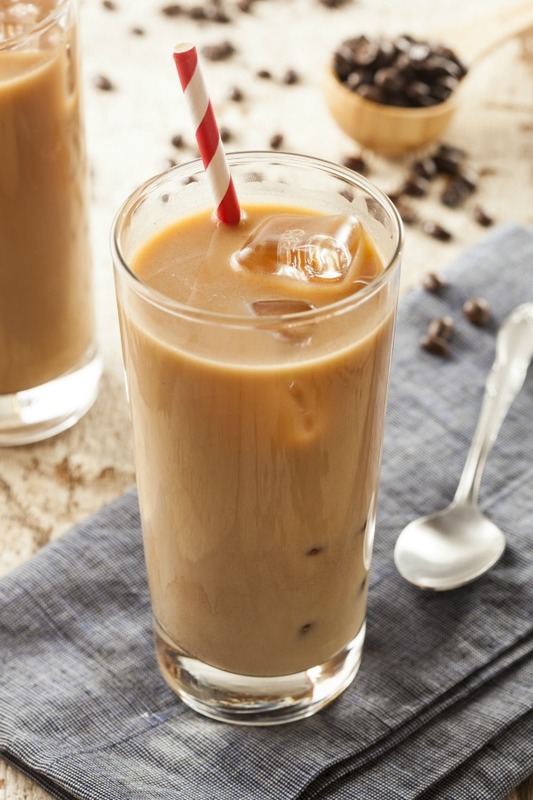 Note: This supercharged iced coffee recipe is sponsored by Silk. Thank you for your support, Silk! Now that the weather is warm and sunny and I’m severely sleep deprived, this supercharged iced coffee majorly hits the spot. there’s even has skin toning and clarifying properties! And I have to say, this stuff really works for me! Even being very sleep deprived, I truly feel great and dare I say… energetic?! It’s true! Most of my friends who recently had babies are struggling with hormone and mood issues, but thankfully I haven’t had any issues at all. And I lost all of my 50 pounds of pregnancy weight gain in 3 months without doing any hard workouts (although I am active and do try to go for a walk each day). Could it be because of the supercharged ingredients in this coffee? I think it’s certainly very possible! Here’s why…. I’ve been singing the praises of collagen for years. Collagen is one of the few supplements I believe everyone should add to their diet. From more youthful looking skin to reducing inflammation and joint pain and helping digestion, collagen is a true nutritional powerhouse. It’s one supplement that I swear by and here’s just one reason why: I gained 50 pounds during pregnancy – that was almost half of my pre-pregnancy body weight! Plus I’m in my late thirties and I gained what seemed like 10 bra sizes (really it was just 3). I was told by all my friends and family that I’d be covered in stretch marks because of my age and weight gain. But I didn’t get a single one!!!! Seriously, not a single stretch mark!!! That’s the power of collagen. It’s a miracle worker for skin, hair and nails. I thought I loved collagen back then, but after my pregnancy, I love it even more. I want to shout from the rooftops how great it is. You can read more details about why I love collagen so much and the benefits of collagen HERE. I use THIS collagen powder. It mixes easily with any drink and is tasteless and odorless. You can find it HERE. I add MCT oil to my supercharged coffee because it helps my body burn fat all day long! Many also call MCT oil “fuel for the brain.” It’s especially helpful for fast and lasting energy, focus, hormonal balance and a boosted metabolism. There’s even evidence that it promotes weight and fat loss because it helps balance hormones, improves insulin sensitivity and raises metabolic function. It’s truly great stuff….my husband even asks for it each morning because of the difference he’s noticed. I use THIS MCT Oil. Maca has been highly regarded for centuries as a miracle plant food. It’s most well known and studied for helping balance hormones and mood. Maca has even been called “food of the gods” and for good reason. It contains 55 phyto-chemicals, including vitamins B1, B2, B12, and Vitamin C, zinc, amino acids, calcium and phosphorus – it’s a total powerhouse! Those chemicals play critical roles in hormonal health. Maca is also very beneficial to the thyroid gland, immune system, reproduction system, brain and skin. Can you see why I love it so much? Maca is considered an adaptogen which means it helps the body deal with toxins and physical and emotional stress. HERE is a great article on more health benefits of Maca. I love and use THIS Maca Powder. That’s some pretty awesome, stuff, right?! 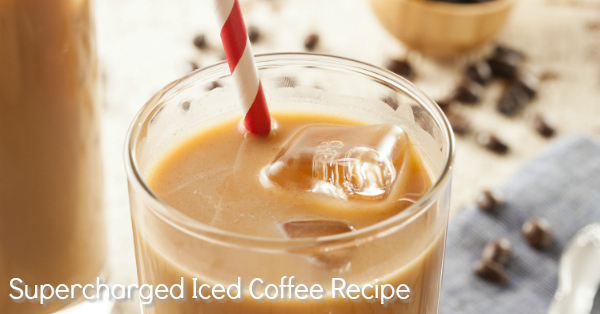 I think you’ll love both the taste and the benefits from my delicious supercharged iced coffee recipe. Enjoy! Stir together all the ingredients except ice until well mixed. Fill a large cup with ice and add in your coffee mixture. Or you can use a blender to blend in ½ cup ice for an iced coffee smoothie! Enjoy! Get a coupon to try Silk dairy-free milk HERE! So happy that you are back on coffee…I know we had talked about how much you miss it! This is pretty much what I do with collagen and MCT, but I don’t use maca consistently. Thanks for the suggestion. And collagen and MCT oil are total game changers in my book. I didn’t just give birth (thankfully!) but I’m an extremely busy 50 year old and can’t believe how much energy I have to get through my days, even when I’m not getting sleep. So happy for you and everything going on in your life! And glad to be able to read your blog posts…totally missed them and you! It’s so nice to see a comment from you, Elizabeth!!! 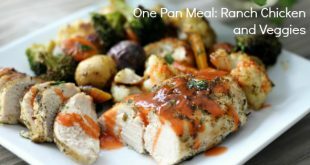 Could you add a scoop of unflavored protein powder for added protein? I live in SA … and have never heard about MCT or Maca powder. Could these two ingredients be sold under other names perhaps? Please let me know. Hi Charmaine, I don’t think so…I’ve only heard and read about them being called MCT or Maca. Could other super food greens be substituted for Maca? Yes, that’s a great idea, Kathleen. Today I found your article it was great. It was very helpful for pregnant women. I did not know about collagen and MCT benefits after reading your blog I know about it. Thanks Kelly for your valuable information. I am curious about the Silk product…. is it organic? Non GMO? Hi Tracey! All Silk products are Non GMO verified, but the newest Silk almond milk on the market is also organic and free of dairy, soy, lactose, gluten, casein, egg and carrageenan! That version is currently only available at Costco, Sam’s Club and BJ’s now, but will hopefully be offered in regular grocery stores soon! I am surprised at your use of Silk products as the ingredients use “Natural Flavor” which could mean an array of things which are not good for you. Is there a particular time of day that you drink it and how often do you drink it? Hi Stacey, I drink this once a day in the morning. It usually keeps me nice and full for a few hours! Hi Claire! Yes, lately, I’ve been switching back and forth between using coffee and matcha green tea for this recipe. I love matcha so much and the benefits of it are awesome! If you are new to matcha, you can find it pretty much anywhere these days…. just be sure to stir it really well – I use a little hand held immersion blender because it’s hard to get it to mix well. This is the matcha I use: http://amzn.to/2u7Thf1 I’ve tried a lot of matcha over the years from very expensive to cheap and this the best quality and taste for the price that I’ve tried! 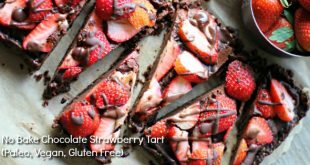 I use a heaping teaspoon of matcha for this recipe. Hope that helps! Thank you, Kelly! I’m ordering all your suggestions this evening 🙂 Best wishes to you and your family! It’s so nice to have you back! I’m glad you’re doing so well and are enjoying being a mom. I’m looking forward to trying this recipe. Just curious about the collagen; I use the same brand but mine comes in a green plastic jar. What’s the difference between this and the peptides you use? 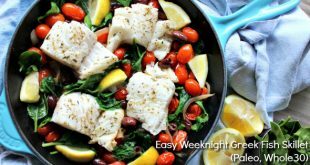 This sounds delicious as well as healthy! Unfortunately since menopause caffeine has really been bothering me. I used to be able to drink a cup of green tea then go to bed and fall asleep right away. I have a Chinese friend who gave me some beautiful green tea she brought back from the mountains in China. I try to have one cup right after I get up, but that still disturbs my sleep that night. So frustrating. I already use the Vital Proteins in smoothies, so maybe I’ll try adding the MCT oil and Maca to that. Thank you for the ideas! Do you think the sauna was helpful in loosing the weight too? Would love to see some photos of your sweet one! Hi Gay! Nice to hear from you! I will post some pics of Sam soon – he is so cute!!! Just wanted to say Congratulations! I’m sure you’re being kept busy. Before losing my wonderful husband several months ago, I used to make him the Bullet Proof Coffee, which he really enjoyed. I gave up coffee a few yrs. ago due to adrenal / thyroid problems. I rarely eat out, but once in awhile when I’m out with friends for breakfast, I will have a cup of coffee, which doesn’t seem to bother me, although I know it’s not good for me and especially since it’s not organic. Collagen is SO beneficial and I use it daily, along with coconut oils, and other healthful foods. I enjoy the compliments I get about my skin. I’ve been staying off of coffee as well as some others who have commented. I switched to Teccino dandelion coffee. It’s gluten free and has no caffeine. It also comes in different flavors. It tastes very similar to coffee. Tastes great! That’s awesome, Vicki! Thank you for that tip – I’ve heard great things about Teccino and it’s nice to get your recommendation of it, too! Hey Kelly, I need a couple of things from this list. Do I need a code for you to get credit if I order from your site. I know I will enjoy this drink. One of my uncles always drank Iced coffee, before that became a thing. I think of him every time I have an iced coffee drink. Hi Kelly, Congratulations on your new bundle of “joy”! Can you post a link for the Gelatin that you use? That way you get credit! Hi Kelly, is there a specific reason to add ice or could we drink it hot ? Hi Kelly, Glad to hear of the new addition to the family! Congratulations! Welcome to the Mommy Life! I’m excited to try these ingredients and see some wonderful results. I have been having issues with thyroid and per-menapause. I have been taking thyax and tri-40 which has been working. But unfortunately my hair has thinned and hoping that this might help balance my hormones. I’ll let you know how it goes. Thanks for the info. I hope this can help, Danielle! Take care! You had me at coffee! Thank you so much for the recipe! I have everything to gain from this drink for my joints especially. Thanks, again! I hope this can help your joints, Katy! It sure does help a lot of others with joint pain. Take care! Hi kelly, i love iced coffee and matcha but even small amounts make me crash really bad and leave me needing more caffiene……would this recipe be any different? How do you think this would be adding protein in to make it a breakfast shake? Awesome! Yes, I was liking that it had the MCT in it. Thanks for looking it over!